So, You've just achieved a spinning wheel rescue. All the parts are there but it isn't exactly racey. From the top.......Put the wheel on newspaper - not on your new carpet! Take off the flyer and bobbin. 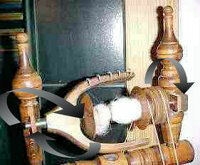 Do all the bobbins spin freely on the flyer axle? If all the bobbins stick, clean up the flyer axle. If there's any rust, take some wire wool or wet and dry sandpaper to it, until the bobbins will purr around. Add a bit of oil (3 in 1, sewing machine or light engine oil). or dust and general grot from the fibre you're spinning will form a very efficient grinding paste and wear your wheel away. Now, down to the bottom. The treadle (right) shouldn't need much attention, but a clean and a few drops of oil wouldn't go amiss down here. While down there, you can also check out the connection between the treadle and the footman - left. (This is a flexible something eg. a piece of braid, leather thong or nylon connector). Occasionally the footman may be completely replaced by a cord.Finally a drop of oil on the bearing where the footman attaches to the crank, (again if it's nylon - run some oil through to clean it, then wipe it dry). Now back to the main wheel. It should be running on bearing points on a pair of uprights. The wheel should be solidly fixed to its axle, and turn easily and run true (If it doesn't run true, that's serious maintenance time.. another story). The wheel axle may just rest on wood, or have leather, brass or nylon contact points or even sealed bearings. Wood on wood, probably needs a little grease, but again, the most important thing is to make sure that the axle isn't turning on a grease/grit grinding paste. Clean and replace the grease if it's easy to get at, otherwise use oil which will stand a chance of flushing the grit out. Use oil for wood/metal contacts and if it's metal/nylon make sure it's clean, and maybe give them a wipe with a greasy rag. And finally what about the spinner! After a number of years, spinners may find themselves a bit stiff with joints and bearings getting distinctly rusty.